For the second week in a row, Shazam! is your box office champion. Warner Bros. and New Line’s adaptation of the classic DC hero brought in $25 million for its second weekend. That’s a 53% drop from its opening weekend gross of $53 million. All told, Shazam! has made $94.5 million domestically. It will cross $100 million before the end of this week. However, the Hellboy reboot wasn’t as fortunate. It came in behind Little ($15.5 million) with a $12 million opening weekend, which gave Hellboy the number 3 slot. Hellboy opened with less than either of the Guillermo del Toro films made during their opening weekends. It also came in well below its $20 million projected opening. These aren’t the kind of numbers that generate sequels, so it may be quite a while before Hellboy gets another chance at cinematic redemption. RELATED: Hellboy Reviews – What Did You Think? Pet Sematary ($10 million) and Dumbo ($9.1 million) took #4 and #5, respectively. Captain Marvel held on to the #6 slot with $8.6 million, which brings its total to $386 million. Captain Marvel‘s road to $400 million may be rocky, and Wonder Woman‘s solo superheroine domestic record appears to be safe at $412 million. Looking ahead to next weekend, Shazam! will likely fall to number 2 when The Curse of La Llorona arrives. The James Wan produced horror film is the last major release before Avengers: Endgame. When Endgame arrives, box office records may fall. But the rest of the films currently out could be severely impacted by Endgame‘s wake. Let us know what you think about this week’s box office numbers in the comment section below! 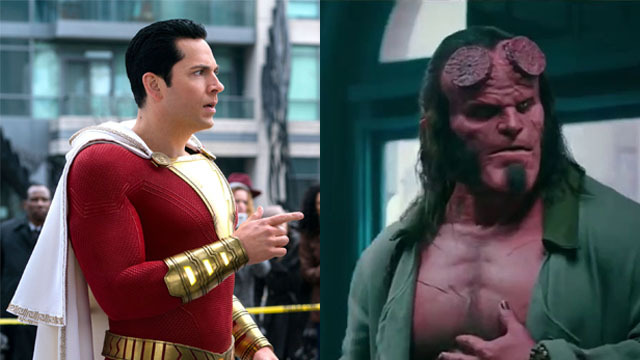 Tags: captain marvel, Hellboy, Shazam!